Author: Marc Seifert. Series edited by: Wilhelm J.G. Möhlig. 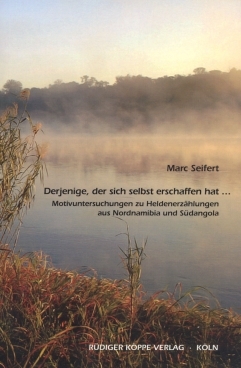 The present volume analyzes and interprets the narrative elements and motives of 30 heroic tales of the Bantu speaking population group of northern Namibia and southern Angola, which have been combined into a corpus due to similarities with regards to content and the appearing heroic characters, and attempts to measure the cultural and historic meaning of these narrations for the communities who pass them on. Furthermore, the author not only devotes himself to the application, but also to the adaptation and expansion of interdisciplinary and discursive methods of motif research, which serve to the editing of oral-literary narrative motives for a comparison within the framework of African Studies and its subjects dealing with text analysis, as well as the formulation and establishment of the two narration types Sambilikita – „Derjenige, der sich selbst erschaffen hat“ (“The one who created himself”), and Tjakova – „Der regenmachende König“ (“The rain-making king”). At first, it is remarkable that a comparatively large number of narrations exists that decscribes the life of various heroic characters in such a noteworthy detailed and stunningly similar way. They seem to be supraregionally – respectively supraculturally – related, which is reflected e.g. in widely identical naming. In addition, the narrations set themselves apart considerably from the residual fictional texts of the region not only with regards to content, but also to form. The narrations predominantly start with a framing of the circumstances, which results in the supernatural birth of the main character – for the most part out of an egg. The main character is then exposed to several threats before he or she goes on a searching hike conditioned by ‘unsolveable’ tasks and challenges, called “Magische Flucht”. At the end of this hike there is always a fight against a sacral king who seems to be superior in the first instance or an ogre who threatens the community out of which the hero – also appearing as unpromising hero or “Jüngster” (“youngest”) – emerges victoriously. What follows is the saving of his kidnapped father, his devoured mother and, if applicable, further victims out of the devourer’s belly. The heroic tales abruptly end with the takeover of the hero who becomes the new rain-making respectively divine king. Although some of these narrations have already been published, commented on and correlated, a cross-language, -literature or -cultural comparison is lacking so far. This is however the more necessary, because the tales are highly affected by the collective ideas of a southwest Bantu community including their values and culture. Therefore, a cultural ‘insider perspective’ is not sufficient for their analysis – a gap the present book wishes to fill. [...] ist diese Studie eine wesentliche Bereicherung für die allgemeine afrikanische Erzählforschung. Sie gibt Anregung für Motiv-Analysen und für die geplante Erstellung eines afrikanischen Motiv-Katalogs, und weil der Erzählkomplex in verwandten Formen in weiten Teilen Afrikas vorkommt, trägt sie zum weiteren Verständnis bei.